Get them for a limited time. Sonic Runners might have not been released officially at the US or UK yet, but many people all around the world are already playing it. More than 300 000 players are already hooked on the Sega Network’s take on Sonic as an endless runner, and to keep the good numbers going, our favourite detectives from Team Chaotix are stopping by. You can get Espio, Vector or Charmy for a limited time if you are lucky enough to get the multi coloured spotted egg who contain one of them at the premium roulette. Every spin costs 50 red rings, so be careful. You will get one of them at random if you hit the right egg. Espio is Speed type, Vector is power type, and Charmy is, of course, fly type. Every one of them will get you a 75% ring bonus increase too. 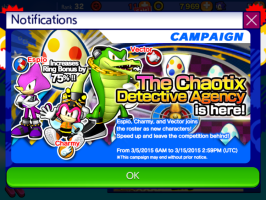 The Chaotix campaign started lasts March 5th, and will remain until March 15th. So hurry up if you want to play as one of them, as there is no other way to get them ( for now, at least).